20% Thinner Than Current Protective Underwear. Soft Waist Elastics Provide a Secure, Comfortable Fit. 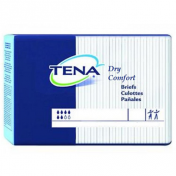 TENA Dry Comfort Protective Underwear, by SCA Incontinence Care, are high quality incontinence protection underwear that combine comfort with affordability, for individuals who require moderate incontinence protection. With a core that is 20% thinner than the average current incontinence underwear, the TENA Dry Comfort Protective Underwear are highly discrete while maintaining their high level of effectiveness. 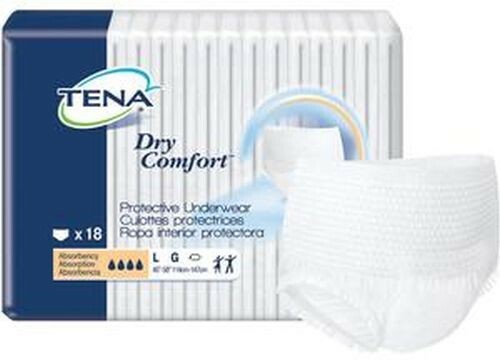 TENA Dry Comfort Protective Underwear feature soft waist elastics that provide a secure and comfortable fit, as well as super absorbent polymers that quickly lock away moisture and odor, so that the wearer can go about their day worry-free. The targeted acquisition zone wicks away moisture into the absorbing core and locks it away to promote skin dryness and health. Since getting the proper fit is very important, the TENA Dry Comfort Protective Underwear feature a blue waist elastic to indicate which side is the back of the underwear and size printing for ideal fit. Vitality Medical carries other pull-on style protective underwear, such as the Tranquility Premium OverNight Disposable Underwear and Attends Underwear Super Plus Absorbency. 20% Thinner Than Current Protective Underwear While Maintaining High Absorbency. Super Absorbent Polymers Lock Away Moisture and Odor For Effective Leakage Protection. Target Acquisition Zone Wicks Moisture Into the Absorbing Core and Locks Away Moisture for Skin Dryness. Blue Waist Elastics Indicates Which Side Should Be in the Back. Size Printing Indicates Correct Product Selection and Ideal Body Fit. Convenient Tear-Away Sides Makes Product Changes Easy and Fast. Have purchased 4 different 'brands' over these past 5 years. And (for me) TENA cannot be beaten; in quality or price. Service is simply - none better - when placing and receiving my order. Give both TENA and Vitality Medical a try for your next needs.